Despite the visible growth Nollywood has enjoyed over the last decade in the box office, there is still a lot of room for improvement, especially regarding revenue generated by non-comedy movies attempted on the Big Screen. Currently, the industry seems content with replicating and cashing out on the success of comedies, case in point – Last Trip to Jamaica and more recently, The Wedding Party. For this reason, movie critics have clamored for more diversity in the films being produced and a shift away from comedy to other interesting and feature-worthy genres. 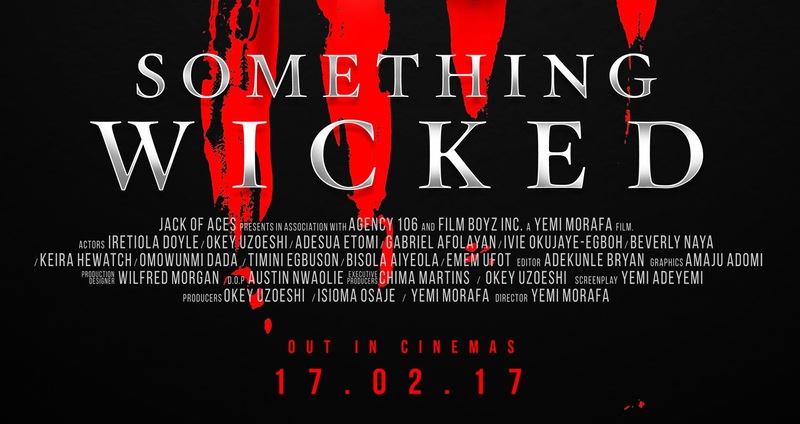 Something Wicked, a psycho-thriller produced by Isioma Osaje, Okey Uzoeshi and Yemi Morafa (also director), attempts to do just that. It tells the story of Abel (Okey Uzoeshi), a young man in his late twenties who is forced to take up shelter in his Aunty Hauwa’s house (Ireti Doyle) after he lost his parents to unrest in Northern Nigeria. Once he arrives, however, strange happenings become the norm in the otherwise regular lives of Hauwa and her three kids (Gabriel Afolayan, Ivie Okujaiye-Egboh and Beverly Naya). At the end of the day though, does the film really hit the mark? Technically, Something Wicked makes quite the compelling argument. It starts off slowly, actually too slowly – immersing you in the dynamics of its characters – including one of my favorite depictions of family/sibling relations on the Nigerian Big Screen – until it grips you. Then, with a sudden change of pace, the movie picks up with a succession of disappearing characters and discovered bodies. It is a riveting tale – at least in the second half, characterized by fairly good acting performances leading to a somewhat unexpected climax. Ivie Okujaiye-Egboh’s portrayal of ‘Baby’, Hauwa’s mute last child, is one of the highlights of the film (no wonder she’s nominated for supporting actress at the AMVCAs), Adesua is a delight as usual and had the best lines hands down! Let’s not even talk about how much better Beverly Naya has become at holding her own on screen or Bisola Aiyeola’s perpetual state of drunkenness. The male actors also pull their weight. Okey Uzoeshi believably channels his inner psycho behavior and Gabriel Afolayan continues to prove that talent does run in his family. Once you see Something Wicked, it is a little clear as to why the film won a whooping six (6) awards at the ‘Best of Nollywood’ awards in 2016 (including the award for best movie). However, this movie is not without its flaws. The pace is slow for the most part; the relationship between Adesua Etomi and Ireti Doyle’s characters was unclear and surreal for a boss/employee. Also, we feel the detective’s name could have been mentioned a few times less than it was – once or twice, or maybe even three times was good enough comic relief, but I realize most people will enjoy this. Furthermore, Omowumi Dada was quite good as the mute ‘Uber driver-like’ girlfriend to Gabriel Afolayan’s character, until she was ruined with her lines in the second half of the movie. Altogether, Something Wicked delivers a thrilling watch that evokes laughter at certain points and leaves you at the edge of your seat at others. It is a good attempt away from cliché comedies and a film we recommend that you go see.